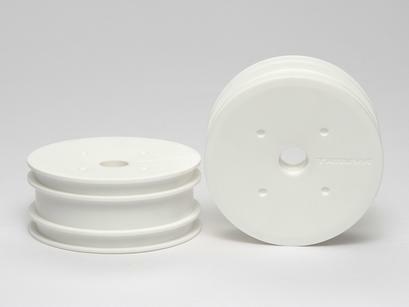 These white dish-type wheels are made from tough ABS resin. They perform excellently on high-grip surfaces such as carpet and asphalt. Their greater rigidity also improves durability at the point of attachment to wheel hub and pin. Note: while the design is largely the same as existing nylon wheels Items 51414, 51320 and 51321, the dimensions differ slightly. Compatible with TRF201 and DN- 01 chassis cars.